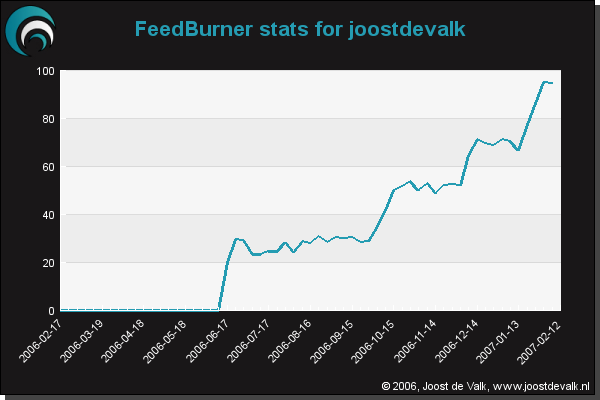 Joost de Valk, creator of such useful tools as the Domain Info Checker and a Greasemonkey statistics detector, has released a neat tool for FeedBurner users that lets you chart your blog's circulation numbers for up to three years. Normally, users of FeedBurner's free StandardStats service can only chart their circulation count for the past 30 days so this is a major improvement courtesy of the FeedBurner Awareness API. Simply enter your FeedBurner name, choose a time frame, and pick the size of graph you want to create. You can even compare subscriber numbers between up to four blogs with the history comparison tool. If the tool doesn't work for a particular blog, it's not a bug: more likely, the feed owner hasn't enabled the FeedCount service. iTunes Not Working in Vista?